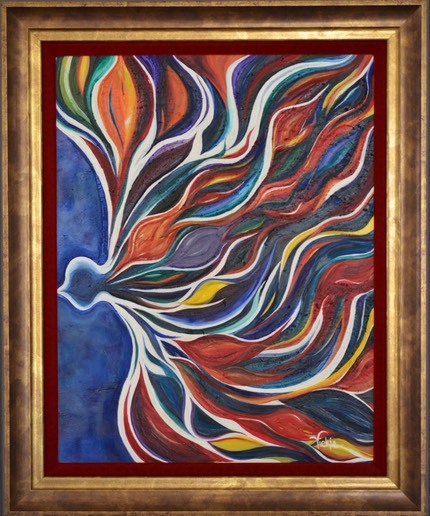 Painting Prayer is a ministry of Art, inspired by the Holy Sprit through prayer and meditation. This ministry began very simply. In reading the Word of God, listening and prayer. Over 25 years of seeking and finding, learning to believe and confess my unbelief. Learning to quiet my heart, mind and spirit allowing the Holy Spirit to speak and reveal what God's purpose was revealed little by little. I have always believed in praying for my church body. One day I went to pray and found myself alone in God's Word. Luke 12:49 & 50 "I came to send fire on the earth, and how I wish it were already kindled! "But I have a baptism to be baptized with, and how distressed I am till it is accomplished! Matthew 3:11 "I indeed baptize you with unto repentance, but He who is coming after me is mightier than I, whose sandals I am not worthy to carry. He will baptize you with the Holy Spirit and fire watches. As I became consumed with a Holy Passion for Truth, God began consuming me with a fire of repentance and impartation to paint God's Word. A vision birthed within me and through the refining process of the Holy Spirit this process began to reveal God's Word internally in my spirit. This is how this ministry began with the vision and passion for the 1st painting. Just for the record I never painted anything with oil before "The Dove of Fire".